Hey, what should we do today? 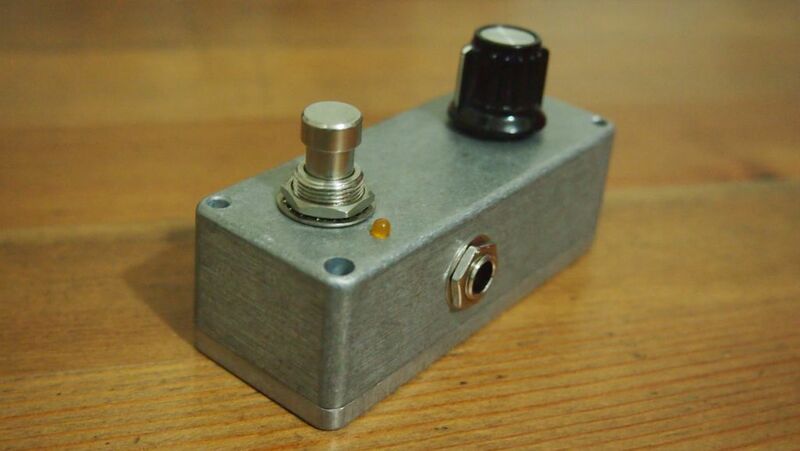 How about making a fuzz pedal? Cool, I knew you were up for it. 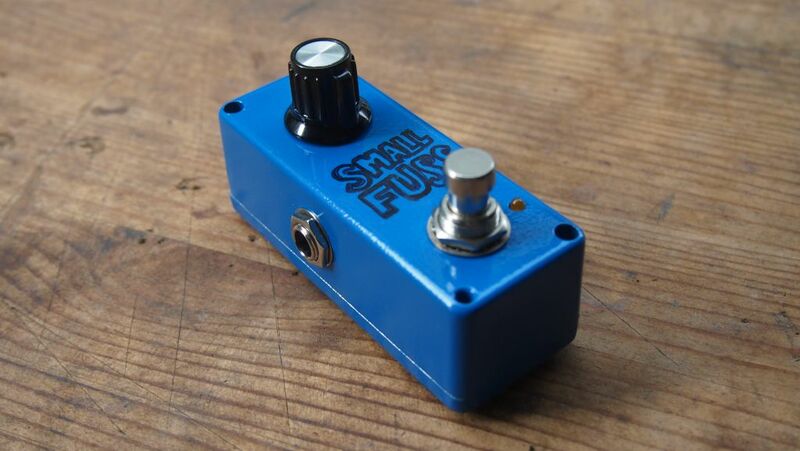 As you may be aware, I’ve recently been helping my friend Adam with a few guitar projects and he was keen to get started on pedal making (specifically a fuzz pedal). I suggested the Bazz Fuss as an easy starter project. It’s only 5 components (and a pot) and it sounds good too. 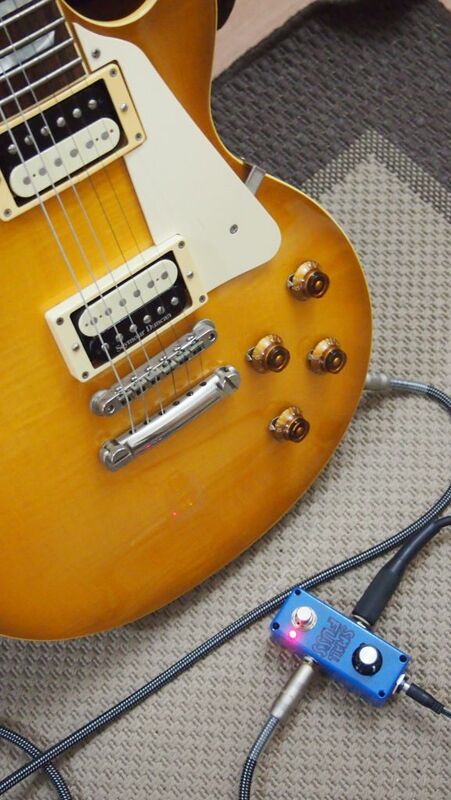 It's designed primarily for a bass guitar, but it sounds great with a normal guitar too. Since I hadn’t already made a Bazz Fuss myself, I decided it might be fun to do so. Apart from having one for myself, it would be handy to have one to refer to if Adam ran into any issues while he made his. 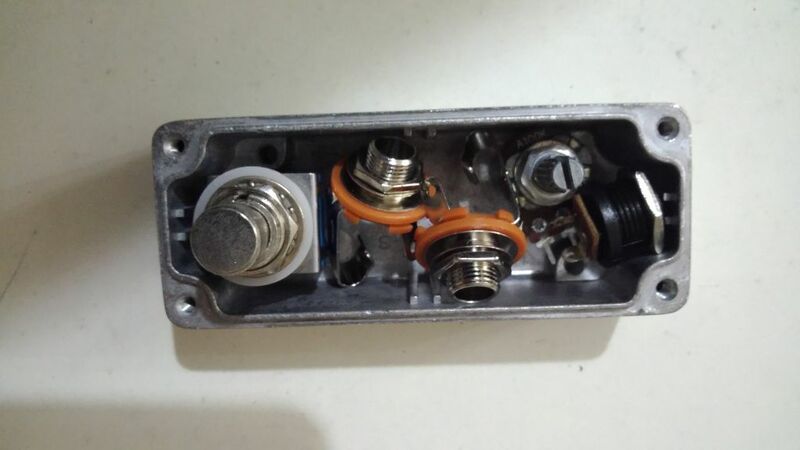 I decided to challenge myself a bit and see if I could fit it into a Hammond 1590A enclosure. They’re pretty hard to find round these parts, but I did manage to find an enclosure that had almost the same dimensions. 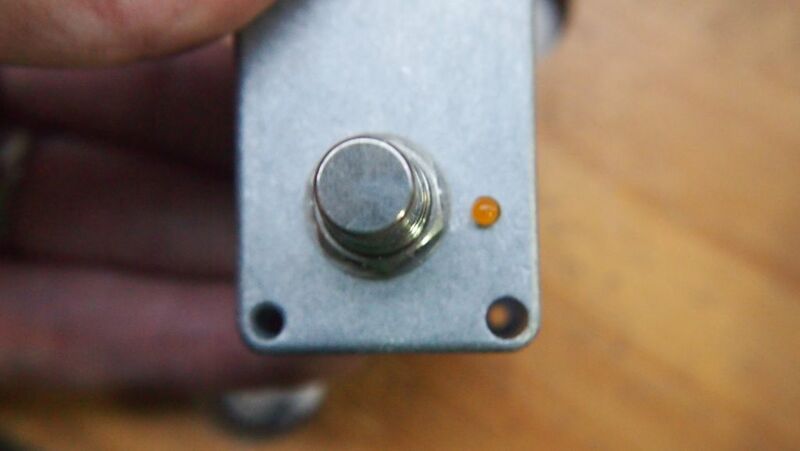 In fact it’s slightly tighter than a 1590A, but hey, that’s just part of the fun, amirite? 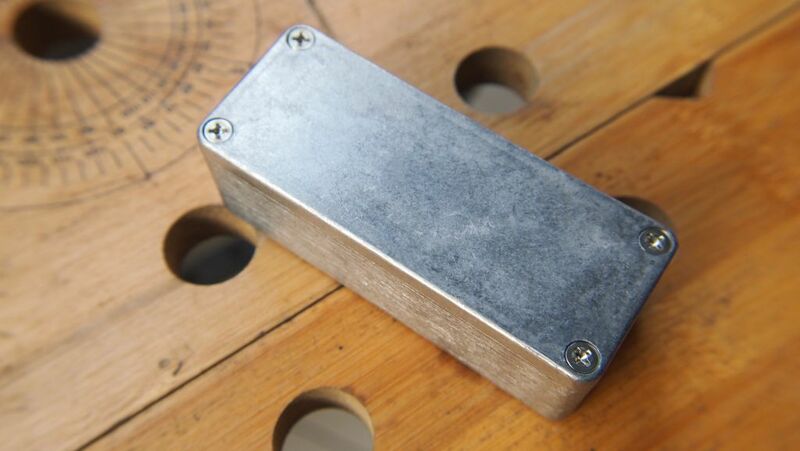 Just for reference, a Hammond 1590A enclosure measures 93 mm x 39 mm x 27 mm. Mine measures 90 mm x 36 mm x 30 mm. The walls are a bit thicker and there are some extra bits inside which will make it even more cramped. And here’s the inside. 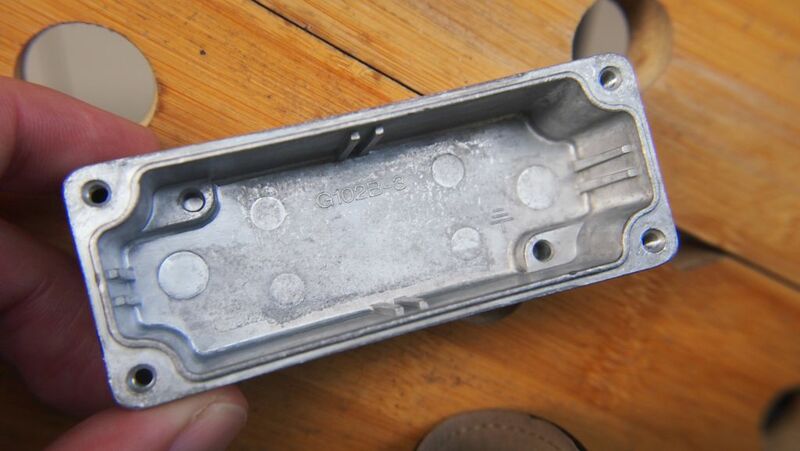 You can see some additional metal in there that you would ordinarily screw a ground screw into, as well as some circuit board slots (which I won’t be using). The answer is “just about”. So we start drilling very carefully. 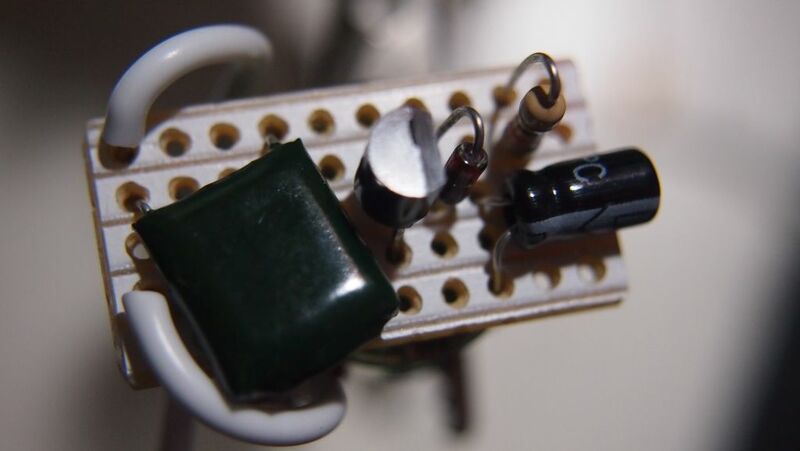 I’m testing the jacks with something plugged in, just to make sure I can still do that without any contacts banging up against anything they shouldn’t. In a normal-sized enclosure this would be less of an issue, but things are very close together in here. 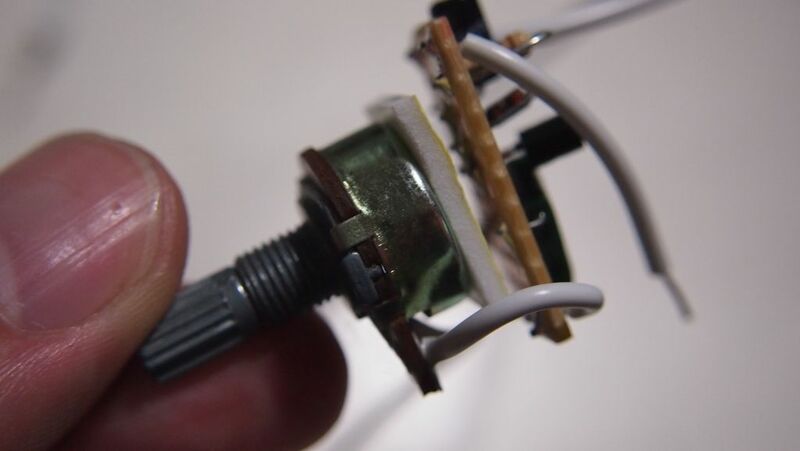 Next to go in is the DC-in jack, since there’s really not much flexibility there. 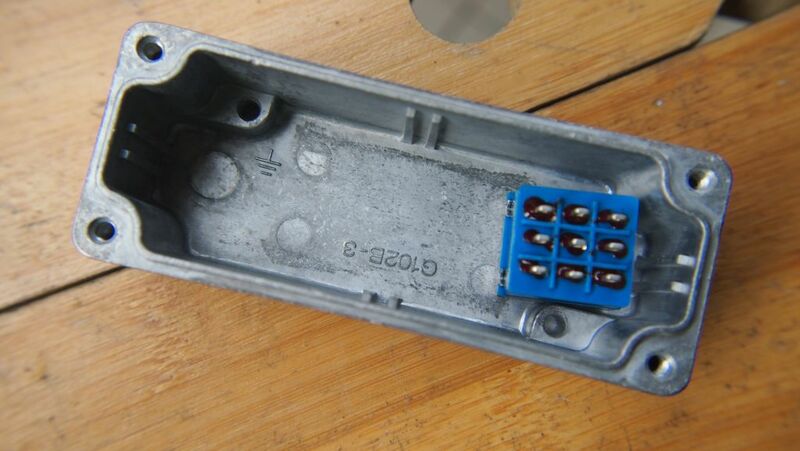 Once that’s done we’ll be able to see what space is left for the pot and the circuit. OK, the pot can just about fit in here, with the legs bent up (in fact I ended up cutting off parts of the legs to help them fit). Just one more item and that’s the LED. I decided to go with a smaller 3 mm LED. 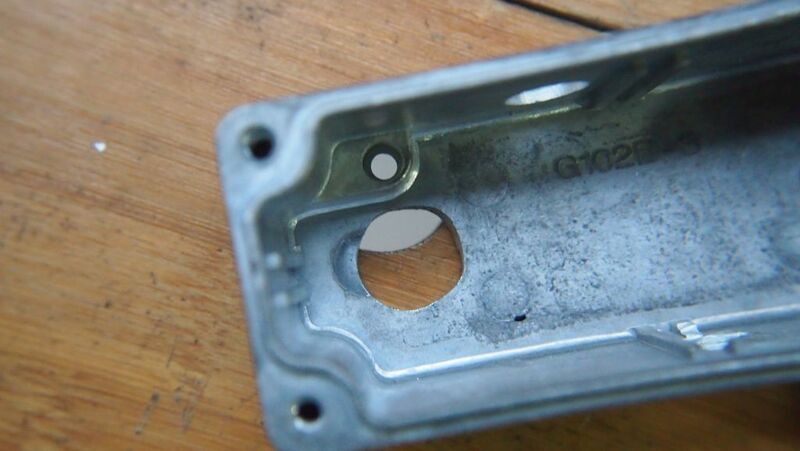 And I also decided to make use of one of the little grounding threaded holes I mentioned earlier. 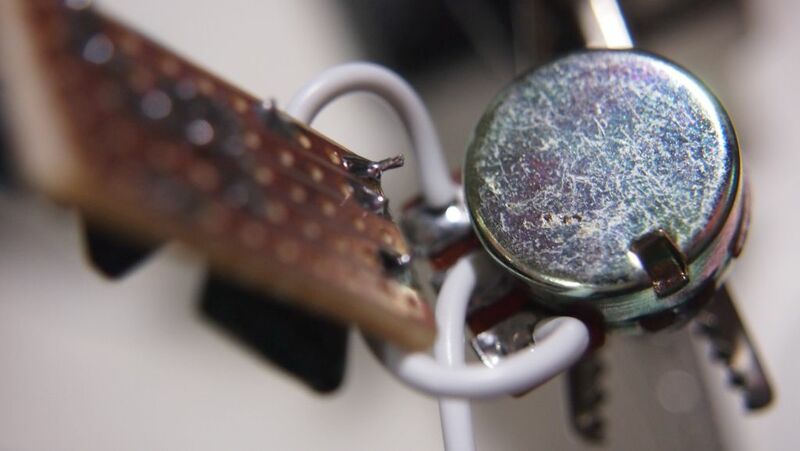 When you’re trying to fit a circuit into something this small you really have to think about how big your circuit board can be and still physically fit. 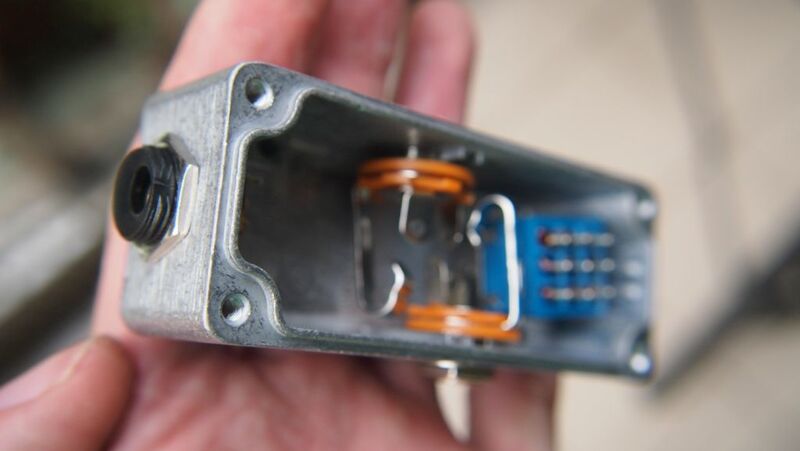 Not only that, but things like whether the capacitors can sit vertically without hitting the back of the enclosure (they couldn’t, which is why they’re lying flat). Before we wire this up, I’m going to paint the enclosure. 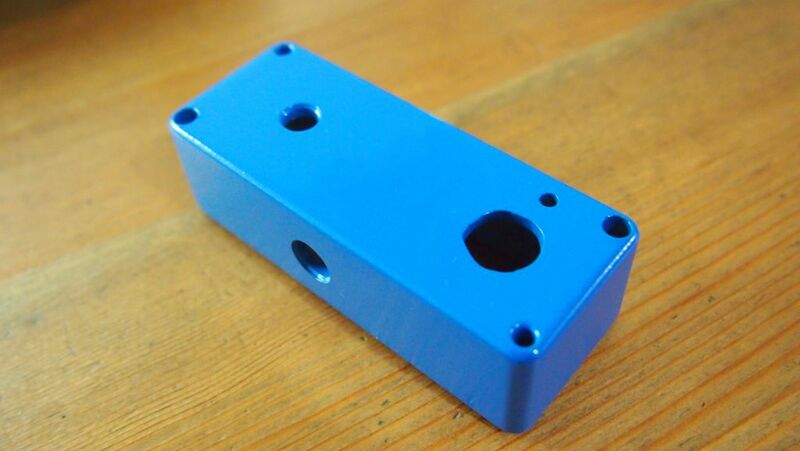 How about blue? And here it is wired up. 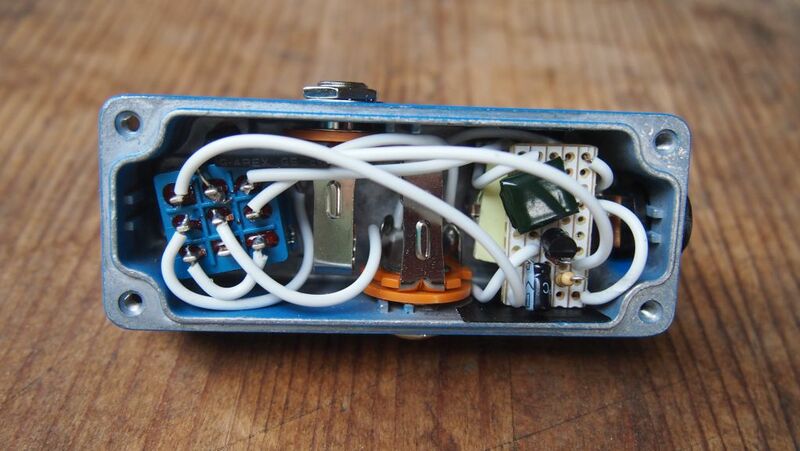 Not the easiest pedal wiring job I’ve ever done. I’ve put some insulating tape anywhere where there was a danger that something might touch something it shouldn’t, and that included the inside of the back cover. Finally it’s time to put it together. 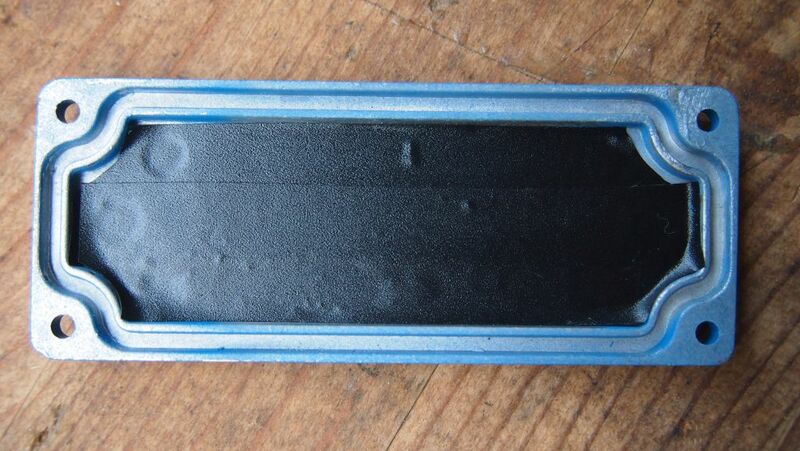 As you can see above, my "Sharpie" decal didn't turn out as well as I'd hoped, so I made something up in Illustrator, printed it out on normal paper, stuck some Scotch tape on top to make it look laminated, and then put double-sided sticky tape on the bottom. Et voilà, a cheapskate decal. The first time I tried it out, it sounded bad. It worked, but not well. I replaced the 10k resistor with a 100k one and it sounds great now. You may want to do the same. Hey bro, I just found your blog and view all your work. It's amazing, congratulations!! You won a new follower today. Regards! Thanks, Juan Manuel. Welcome to the site! 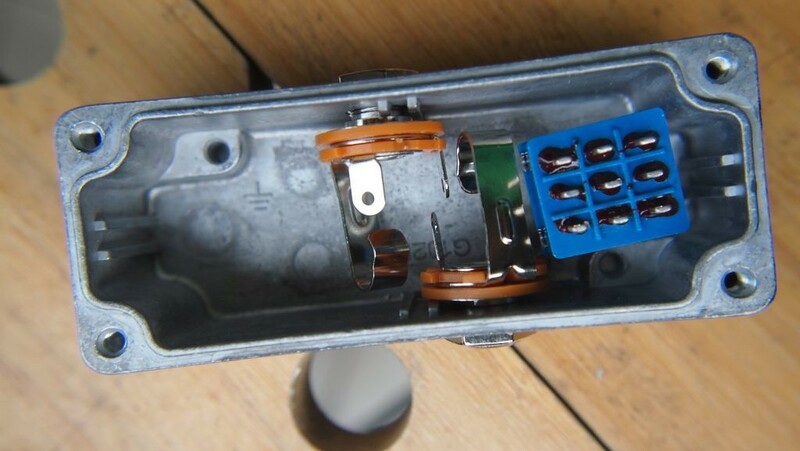 is it possible to build it with 5v instead of 9v? In that case, do i have to change every components? I don't have time to do the calculations just now, but lowering the value of R1 should work. 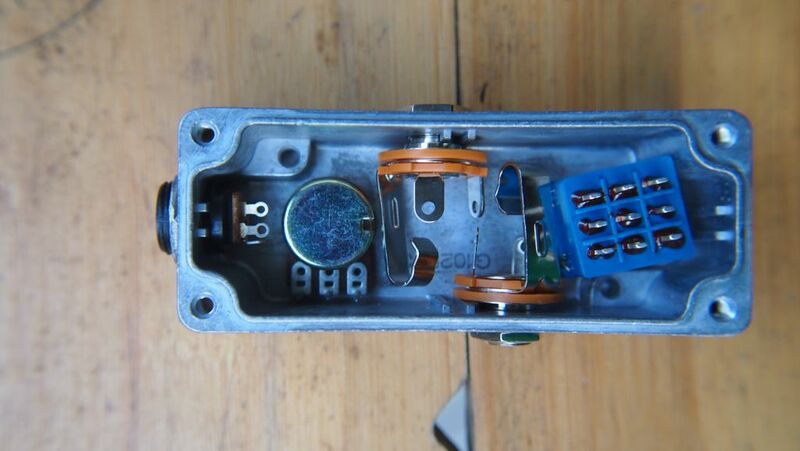 You can then adjust the capacitors a bit if you're not happy with the tone, but otherwise they should be fine as they are now. Let me know how you get on. first off, great work with you blog. On the off chance that you're still monitoring this comment section, I've run into a little problem with this project which I hope you can help me clear up. 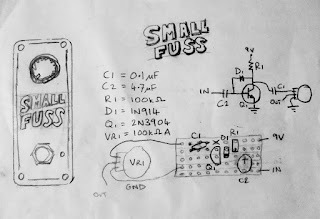 I'm fairly certain that I've got the circuit right, however, it doesn't seem to affect the signal in any noticeable way. Could the fact that I'm using passive pick-ups have something to do with it? If so, what would I need to adapt in order to make it work? Thanks for your comment. It should definitely affect the signal in a big way. 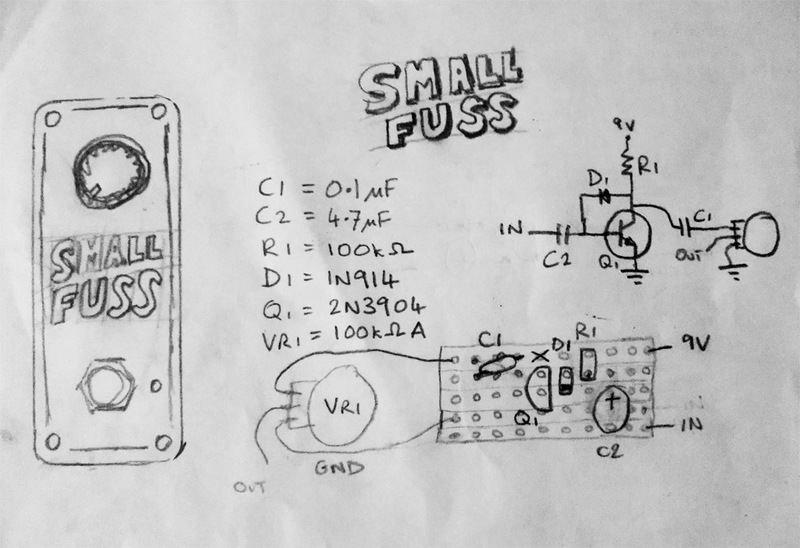 Did you try a 100k resistor instead of the 10k one? That's probably not it anyway. 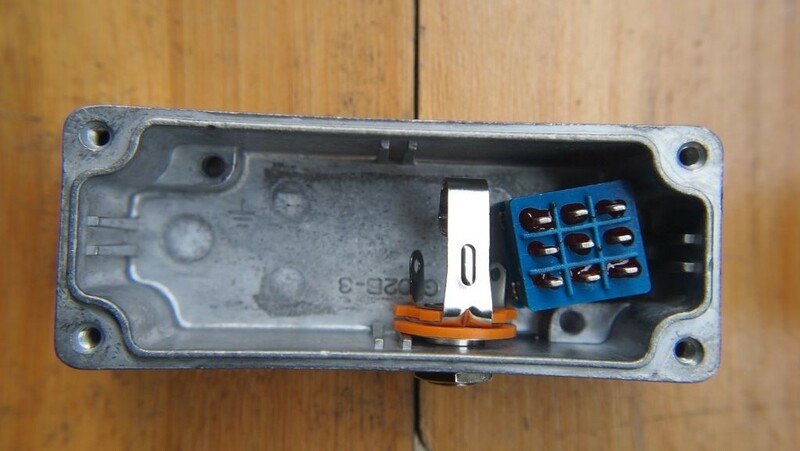 I'd definitely be checking the wiring extremely carefully, as well as the switch. Also if it's in the enclosure, make sure nothing is shorting out. The passive pickups should be fine. I use passive pickups too. Thanks for the quick help. I'll give it a good close look, then. Wooooah this so so cool. I could suggest this to my uncle who loves music. Great job! 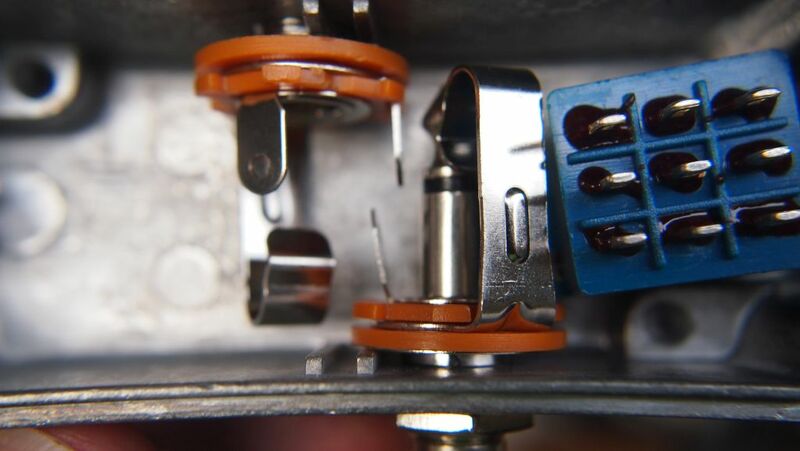 I know this is an old thread, but is the 3pdt switch supposed to be oriented with the lugs like that? I thought the lugs should always be left to right not up and down? Hi Fatalex. 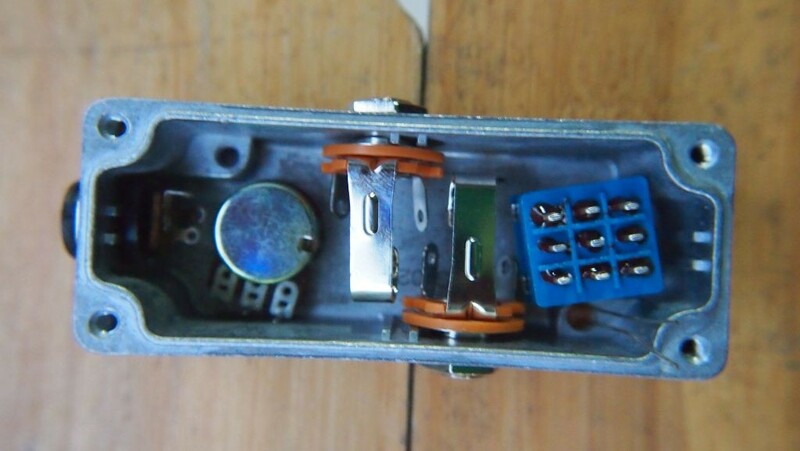 There's no hard and fast rule about which way the switch has to be oriented (as long as you wire it up accordingly). It's true that it is more commonly seen in a horizontal position though. In this case, it was just squeezed in that way due to lack of space.